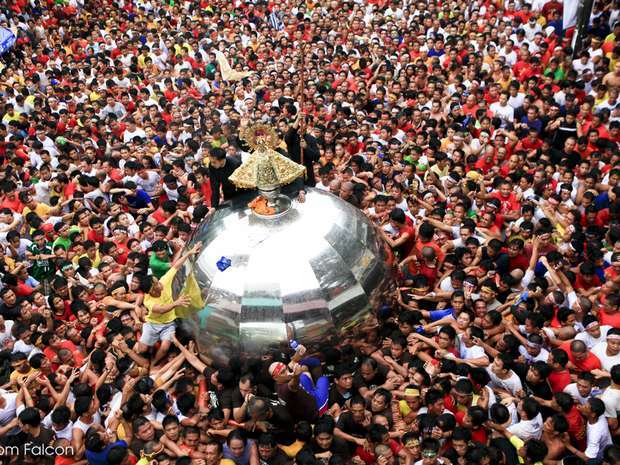 thousands of pilgrims, devotees, tourists come to Naga City--also known as the Pilgrim City and the Queen City of the Bicol region--in the Philippines every September for a nine-day festivities in honor of Our Lady of Peñafrancia, the Principal Patroness and Queen of Bicol, endearingly addressed by Bicolanos as Ina (mother). The shrines in Naga, gathering more than five million devotees every year, is also one of the biggest Marian Pilgrimage Sites in the world. The story of Our Lady of Peñafrancia began in Paris on September 4th, 1401 when Simon Vela was born. While born into a rich family he eventually gave all his riches to the church, charities, and the poor. Simon preferred to spend time in the church and one day lost consciousness while devoutly praying. He was awoken by a voice, telling him to travel to Peña de Francia (Rock of France), where he would find the image of the Blessed Virgin Mary. For five disheartening years Simon traveled west, and came across a hill in which he saw the Virgin Mary with the Child Jesus in her arms. There, with the help of five men from a nearby town, he began to dig where she had directed, and on May 19th, 1434, they uncovered an image of the Blessed Virgin Mary with the Child Jesus. The Filipino tradition of honoring Our Lady of Peñafrancia began in the Bicol region in 1712, when Miguel Robles de Covarrubias, the son of a Spanish government official, fell very ill. While ill, he and his family prayed to Our Lady of Peñafrancia, and he vowed that if he recovered he would construct a shrine in her name. When he recovered he was eventually ordained a priest in Naga City, and set forth his plans to construct the shrine. During the construction he also ordered for an image to be made, similar to the one he prayed to while sick. Unfortunately the local artisans had run out of red paint, and so a dog was killed in order to coat and paint the image. This prompted a miracle as the dead dog that was thrown into the river began to swim to the bewilderment of hundreds of people. News of many more miracles also spread and so did the devotion to Our Lady of Peñafrancia. Today, millions of people gather every year on the third Saturday of September in the Bicol region to honor Our Lady of Peñafrancia. Carpio, Jose Maria Z. Ina and the Bikol People: A Journey of Faith. [Bicol]: Archdiocese of Caceres, 2002. Print.